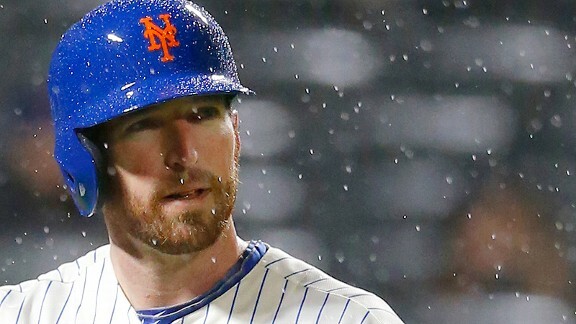 Ike Davis did himself no favors with an 0-for-4, four-strikeout performance Friday night.Ike Davis moved closer to a demotion to Triple-A Las Vegas with his third four-strikeout night of 2013, which matches the franchise record for most in one season. He has one hit in his past 42 at-bats. Terry Collins said Davis was unnerved enough that he spent the 75-minute rain delay before the game was suspended in an indoor batting cage adjacent to the Mets' clubhouse. "I know it's wearing on him," Collins said. "I talk to these guys every day. I know it's wearing on him. He took batting practice when they stopped the game. He got in the cage. So I know it's wearing on him. These players get to the big leagues because they're very talented guys. They haven't had to deal with much failure in their whole lives. When you deal with what he's going through right now, it's pretty hard to take it, because you've never been there before. Sometimes you think it's a growing lesson, but other times it can break you down. That's why he's got so many guys supporting him, because we certainly don't want that to happen." How much longer can the Mets stick with Davis at the major league level? "I'm not sure," Collins said. "Some of the decision has to be what's best for Ike Davis, because you've got to still look in the long term. And this guy is too big a piece of our offensive puzzle to continue to struggle like he's struggling, because we need him. If we're going to be a team to contend with, that bat needs to be in that lineup and hitting. And right now it's not. He's not the reason why we're playing bad. He's one of them. But there's a lot of other pieces that aren't doing the job also. Now we've just got to figure out what's going to be best for him moving him forward."